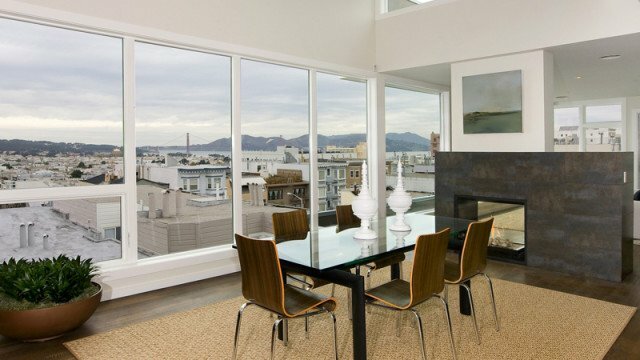 Sophistication, gorgeous views and exceptional craftsmanship define this stunning two-level penthouse in the heart of Russian Hill. Its thorough, ground up architectural and structural remodel was completed in 2010 and included the creation of an open floor plan, unique design elements and unparalleled attention to detail. Spanning over 3,200* square feet with an additional 800* feet of outdoor space this flat offers the best of modern living. Two bedroom suites and two guest rooms on the same level feel private and luxurious. The living, dining kitchen areas are expansive and ideal for entertaining while the three baths with showers and separate two powder rooms provide ample access for both you and your guests. Your eyes will be drawn to gorgeous views of the Golden Gate Bridge and Russian Hill, the outstanding finishes will make you want to linger. This home was built with many unique design and environmentally friendly features that include radiant heat throughout, human-harmonious insulation and health conscious paints. It is solar-power ready, energy efficient and designed to be a healthy environment for its future owner.